Rooms Edit: Gold and Teal Living Room Ideas. Give your lounge a luxury golden glow and beautiful blue hue this winter. The interior colour dream team is teal and gold which always looks delightfully decadent. 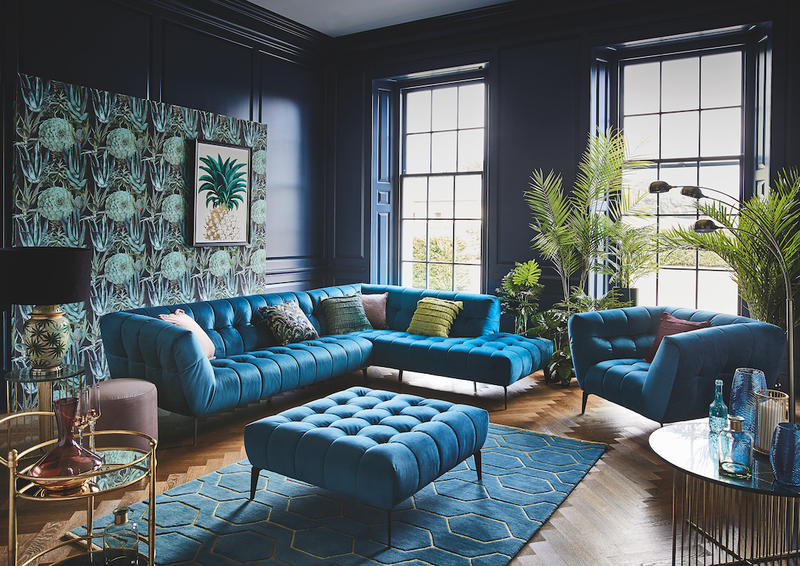 I’ve picked out my favourite teal sofas, fabulous fringed cushions and geo pattern rug to tempt you. Think 1920’s Gatsby Glam and you’ll be on the right track with your Gold and Teal Living Room Ideas! Azalea Collection: For plush and super stylish seating treat yourself to this selection of teal velvet upholstered seating. Choose from a right-hand or left-hand facing corner sofa £1899 (1AZARCRNFA20), armchair £499 (1AZACHAIFA20), sofa £729-1015 (1AZA1.5SFA20, 1AZA2STRFA20, 1AZA3STRFA20), or footstool £319 (1AZASTOOFA20). The seat and back cushions are perfectly plump with beautiful button detailing while the legs are slender and sophisticated in black metal. Gower Marble Nest of Tables: This trio of 1920s style tables are perfect for anyone who wants to save on space without compromising on luxury. The white and grey marble tops rest neatly on golden frames with circular bases, £299 (GOWEBD32BULK). Turquoise Plant Stand: Stylish blue plant stand held with a golden tripod shaped base. Ideal for bringing a touch of lush green planting inside, £36 (PLST0142ST55). Luxe Velvet Cushion: Timeless and elegant teal square cushion which looks amazing when paired with mustard and golden tones. The fabric is 100% polyester while the insert is filled with feathers, £18 (LUEX0001ST42). Gatsby Cushions: These vintage Gatsby style cushions are fabulous with soft flirty fringing. Mix the golden mustard (GTBS0002ST42) with the teal (GTBS0003ST42) for a splash of colour, £26. Large Glamour Vase: Matt blue cylindrical glass vase with a golden base for a touch of luxury, £23 (GALM2881ST52). Baoli Teal Throw: Cosy knitted throw with a fusion of teal and golden hues for a vibrant throw complete with fringed edging, £40 (BAOL1TEAST43). Arris Rug: Teal rug with a stunning golden geometric pattern, made from wool and viscose mix which has been hand tufted in India, £349-1145 (WEAR20281TEA). You can buy the products mentioned in this feature from Barker and Stonehouse. You can either shop online at the Barker and Stonehouse Website or visit one of their shops. This is the perfect store to find beautiful furniture for your home whether you’re looking for a statement sofa, beautiful bed or your dream dining table. With furniture, storage, home accessories, decorative objects, lighting and rugs, there’s plenty to choose from. Brands include Ercol, Timothy Oulton, Parker Knoll, B&B Italia and many more prestigious designer companies so you’re in for a real treat! Author: Homegirl London. Prices correct at time of publishing. The product codes have been noted to make it easier to locate the products. Photographs: courtesy of Barker and Stonehouse. Disclosure: This is a sponsored feature; the story idea and products were selected by Homegirl London. Barker and Stonehouse is one of my affiliate partners which means that if you click through from my website and purchase items from the affiliates I will earn a small commission.